Magic Mirror Hire for Kent, Essex, Hertfordshire, London | OMG! selfie and an original character voice. The Mirror LOOOOVES you! Our brand new OMG Magic Selfie Mirror Hire is a novel twist on a group selfie & can create memories that guests are able to take home with them. The mirror talks to each guests and encourages everyone to press the button to strike a pose. The on-screen magical display tells guests when the photos are being taken. Our OMG Magic Mirror is perfect to set up in entrances or in main rooms to capture the vibe of the evening whether you’re in Essex, Kent, London or Hertfordshire. Our mirror comes complete with a huge prop box & instant drying print outs to ensure no photos are smudged. Complete with a personalised caption, your guests are sure to remember the evening for months to come. 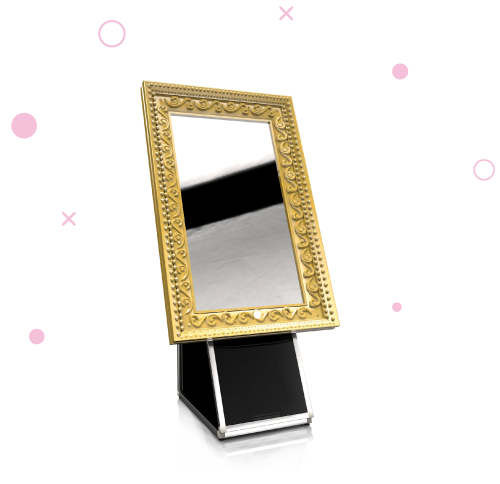 The OMG Magic Mirror is the must have addition for ANY event & will get your guests talking about how unique our mirrors are. If you want something that will stand out, you’ve found what you’ve been looking for. Send us an enquiry by using the form below or give us a tinkle on the blower & one of our friendly OMG Team will love to talk to you about how we can add the WOW factor to your evening. We’re ready when you are… 0800 234 3447!